Noble Globetrotter II shows benefits of unique design with rapid crossing into Black Sea. The Noble Globetrotter II was so named due to its pioneering design. Smaller, narrower and equipped with a tower that could be lowered using its onboard crane, it was thought that there were few offshore drilling locations that the Globetrotter design could not reach. However, this claim had not been rigorously tested until this year when Noble Globetrotter II was mobilized to work for Shell in the Black Sea. The briefest glance at a map of the area shows the immense challenge of accessing the Black Sea via the Mediterranean. From easy sailing between Gibraltar and west Turkey, the transit becomes immediately complicated as the land masses close in between Bulgaria and Turkey. Access from the Mediterranean to the Black Sea is via the Sea of Marmara, which separates Asian Turkey from European Turkey. The Sea of Marmara then connects to the Black Sea through the Bosporus Strait. It was through this narrow highway that the Globetrotter II needed to pass in order to reach its commitment for Shell. This posed a phenomenal feat to accomplish. A challenge for all drilling rigs to cross the Bosporus Strait into the Black Sea is that they must pass underneath several bridges. To complicate matters further, per Turkish government regulations, the air draft (the distance from water level to the highest point on the rig) must be less than 58 metres. How would a conventional rig face this challenge? It would need to have a section of the derrick removed in order to reach the required air draft. The derrick would then need reassembling afterwards, an extensive process which has historically taken up to around three months. There could be significant delays while waiting on weather as conditions, particularly wind, would need to be very favorable for the derrick builders to be able to work and for equipment lifts to take place safely. A large floating crane would need to be rented to remove and reinstall the top derrick section and associated equipment. All in all, the process would require an extensive and expensive shipyard visit with significant out of service time. This is where the design of the Globetrotter II came into its own. The rig does not have a conventional derrick. It is equipped with a Multi-Purpose Tower (MPT) that was designed specifically with the challenges of top section removal in mind. The top section of the MPT is outfitted with removable electrical, hydraulic and pneumatic services, and one of the shipboard cranes is large enough to perform the removal and re-installation of the section, thus eliminating the need for a large floating crane or an extensive shipyard visit. How did the challenge progress? Firstly, a brief stop at Besiktas shipyard in Turkey was required to add light winterization to prepare the rig and the crew for the cold winter days in the Black Sea. A specialized skid was built and installed on the vessel to secure and store the top of the MPT once it was removed for the transit along the Bosporus Strait into the Black Sea. The team also installed Shell’s skip and ship equipment for cuttings handling, changed out the ROV umbilical, as well as performed some other client requested projects. The critical activity though was the main lift of the top section of the MPT which was flawlessly performed on January 1. After completing final inspections, on January 6 the rig departed Besikitas and made its way across the Bosporus Strait. With the bridge crossing complete, the challenge of reassembly had just begun. The tough environmental conditions became immediately clear upon arrival at Eregli port in the Black Sea. Snow and high winds caused the port to shut down for 3 days. The sheltered location of the port nevertheless enabled the team to prepare for the reinstallation of the MPT. After the weather cleared, the project team and rig crew began the process of successfully reinstalling the 170 ton section and reconnecting all services. The rig was ready to go to work on January 16. The project was completed safely, under budget and ahead of schedule. What is remarkable is that the entire process from arrival in Besiktas shipyard until the ship was drill-ready took less than one month, and this included the many days needed to complete the various client requested projects. This is thought to be about one third of the average time taken by other rigs that have made the crossing. Equally impressive was the incredible performance of the rig on its first well location in Turkey. As Firas Adi, Noble Operations Manager, described: “the rig performed very well for a period lasting over 5 months with minimal downtime or major events. Shell and their partners were very pleased with the rig’s performance”. Operations were completed on July 7 and the rig sailed off location back to port at Eregli where the team went through the process of removing the MPT again. This time it took only four days and the rig departed port on July 12 back to Sile-1 location for the final DP (dynamic positioning) trials. The trials were completed on July 16 and the rig sailed through the Bosporus, arriving in the Canakkale Port in the Marmara Sea on July 18, where it reinstalled the top section of the MPT. This also took only four days, another major milestone. Excluding the time needed for DP trials, the rig was able to disassemble, transit the Bosporus and reassemble the MPT in 11 days, an achievement that cannot be overstated. 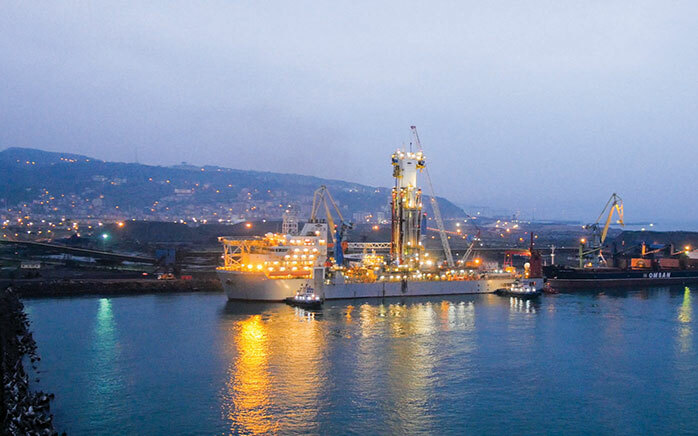 The rig departed port on July 22, headed for Gabon where it will drill another well for Shell. Overall, the unique capability of the Globetrotter II design resulted in immense cost and time savings for the customer and the flexibility to easily access what has historically been a very inaccessible market. This was a phenomenal accomplishment, truly illustrating the rig’s “globe-trotting” capabilities.